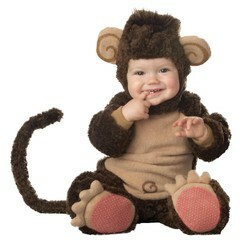 Babies would love to monkey around on Halloween! 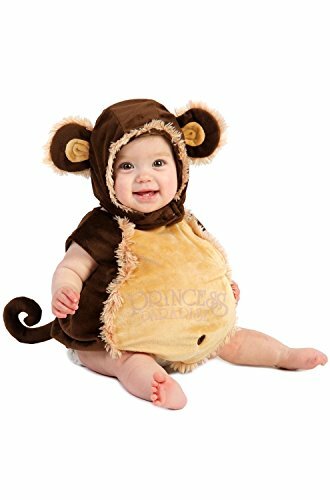 Help your little one get more fun than a barrel of monkeys by getting him an adorable monkey costume! We often compare our babies with monkeys jumping here and there. I do so with my nephews! 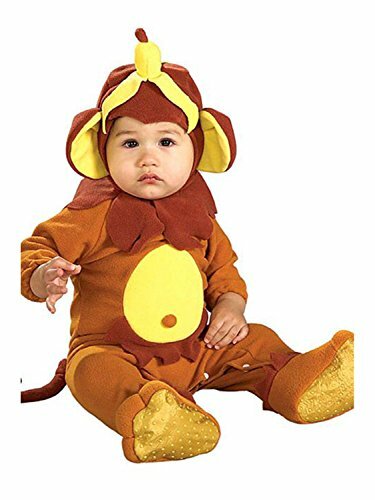 Imagine the fun that kids can have and the adorable look they will get if they are in a complete Monkey outfit! 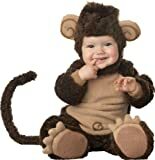 Baby Monkey Costumes would be a great choice for any costume party or Halloween dress up. I have featured some highly ranked awesome and cute costumes on this page. All the products discussed here are budget friendly and of good quality. You can easily order them online and get them delivered at your doorstep within no time. Prepare to venture out this Halloween with your little monkey dressed up in adorable monkey costume! This costume is my personal favourite. I bought it for my nephew for his birthday after looking at the high rankings and happy customer reviews it had got. My little champ looked absolutely adorable in it. The material of this costume is really soft and fleece-like and kids would be very comfortable wearing it. This brown and tan zippered jumpsuit is very easy to put on and take off. The suit has attached tail. Snap-on closures are a big help for mom's who won't have any trouble in changing diaper of their babies. The hood is separate from the suit and has ears attached on it. The skid-resistant booties resemble monkey feet and complete the costume perfectly. Be The One With a Banana Head! You can go for something more funky than above. The attached tail, huge monkey ears and the adorable monkey belly is what i love about this costume! The distinct feature of this costume is the banana that sits on the top of hood. This costume would be perfect for new walkers. They would look adorable in this monkey suit which has snap-on closures on legs. The hood comes separately and can be taken off at will. Booties are included in the pack. Become The Cutest Monkey With a Big Belly! This costume is absolutely adorable with it's stuffed belly! The costume is a plush jumpsuit with snap-on closures and a separate headpeice. You can dress up your baby for Halloween or any other costume party that you have to attend. The soft material and the padded belly of this costume will help keep your baby warm if you live in colder regions. You can put a t-shirt or a long sleeved shirt under it with no effect on the overall looks due to the very natural colors of this costume. The Sock Monkey is a beloved classic tale for kids. Becoming a sock monkey for Halloween will be a great idea and the costume will definitely be a big hit in the neighbourhood. The sock monkey costume is a bodysuit with snap closure pant (for easy diaper changes). It has attached boot covers and a detachable tail. You can choose to be a tailed sock monkey or just go normal! The matching headpeice will complete the outfit beautifully. Curious George is the most famous storybook monkey who is equally loved by kids. This monkey is very popular for his amazing acts and mischeives which he does just out of curiosity! You can buy a curious George outfit for your toddler and make him look cute and mischievous. The costume id a jumpsuit with button up leg closure. The hood can be taken on and off easily and hand and foot covers will make you look monkey all over! The blood-suckling world of twilight monsters never looked so adorable. Your infant vampire will look the part this season.